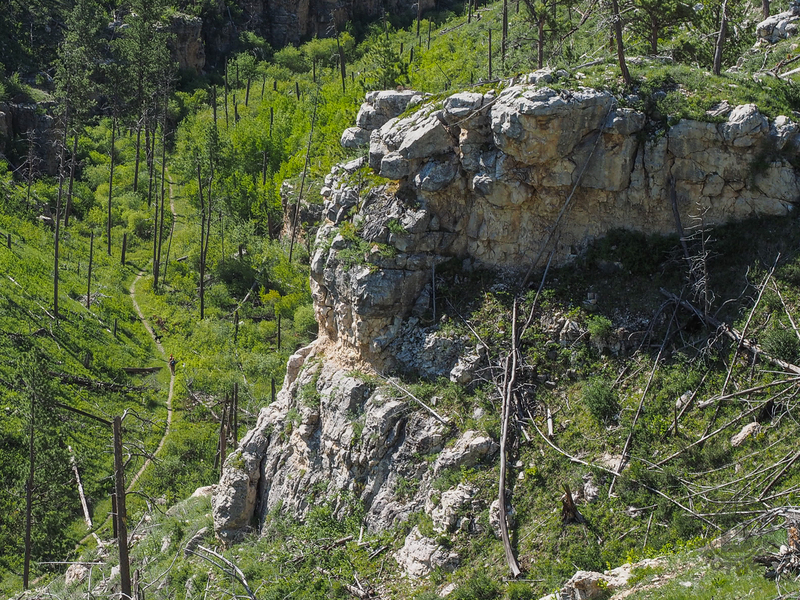 I think of the Hell Canyon Trail in Black Hills National Forest, South Dakota as two hikes. There’s the stroll through the canyon with lush trees and bushes and a wide assortment of colorful wildflowers. Then, there’s the path along the canyon rim that exposes the devastation of the 2000 Jasper Fire, the largest in Black Hills history. The undergrowth is recovering nicely from the wildfire, but the trees may be gone for a century or more. One can only imagine the beauty that must have once existed here. My brother Dave and I hiked this loop on Sunday, May 27, 2018 beginning at 6:30AM and finishing about 11:15AM. Our plan was to hike the loop counter-clockwise, starting in the canyon and finishing on the rim. Hike Rating: Moderate. Mostly level, but there is a transition from canyon to rim. Trail Condition: Good. Canyon portion is grassy and well maintained. Rim portion is quite rocky with some edge exposure and lots of downed trees. Starting Point: Parking area on Hwy 16. Room for about 15 cars. Trail Traffic: We encountered half a dozen other hikers and one equestrian. How to Get There: From Custer, SD take Hwy 16 west 13.5 miles. The trailhead is on the right one mile past the entrance to Jewel Cave National Monument. As we typically do, Dave and I started this hike just past dawn, so we enjoyed seeing the sun rising over the east canyon wall and lighting up the cliffs of the west side with its brightness. Almost immediately there was a patch of wild dwarf iris, a portent of things to come. It was recommended to us by our new friend at the Custer Econolodge that we start in the canyon, because the grade to the rim at the far end is a lot more gentle. As it turns out, she was exactly right. If you start out climbing the rim, it is pretty darn steep. Waiting until the north end to climb to the rim is definitely the way to go. The first half mile gives you a good idea of the size of the canyon. The rock cliffs on each side rise a couple hundred feet and dominate the landscape. The canyon is narrower here. One thing that seemed odd to me is there’s no evidence of the creek or river that carved this canyon eons ago. The next mile the canyon widens, and is surrounded by unburned forest. Mostly ponderosa pine, there is also some birch and aspen to help make things really, really green in late May. Because of the lush ground level vegetation, I suspect this trail may even become a bit overgrown in the summer months… unless there are friendly local volunteers who come out to cut it back. We passed evidence of old Civilian Conservation Corps camps. They were apparently busy in Hell Canyon back in their day. Look for occasional #32 signs posted on trees as your trail markers. This is Black Hills National Forest trail #32. After nearly a week of perfect weather in western South Dakota, on this day Dave and I had to confront a pretty powerful wind that was in our face whipping through the canyon. It even got a bit chilly, as we each pulled long sleeves out of our packs. I don’t know if this is common because of the canyon, or if we just happened to hit a windy day. The farther we progressed into the canyon, the more the wildflowers came to life. What impressed me the most was not necessarily the abundance of flowers, but the wide variety. I bet we saw more than 30 different wildflowers through the canyon, from white and blue violets to an interesting species of columbine, from the dainty shooting stars and star solomon seal to the large clusters of hawthorne blossoms concealing the nasty, nasty spikes on the stems. 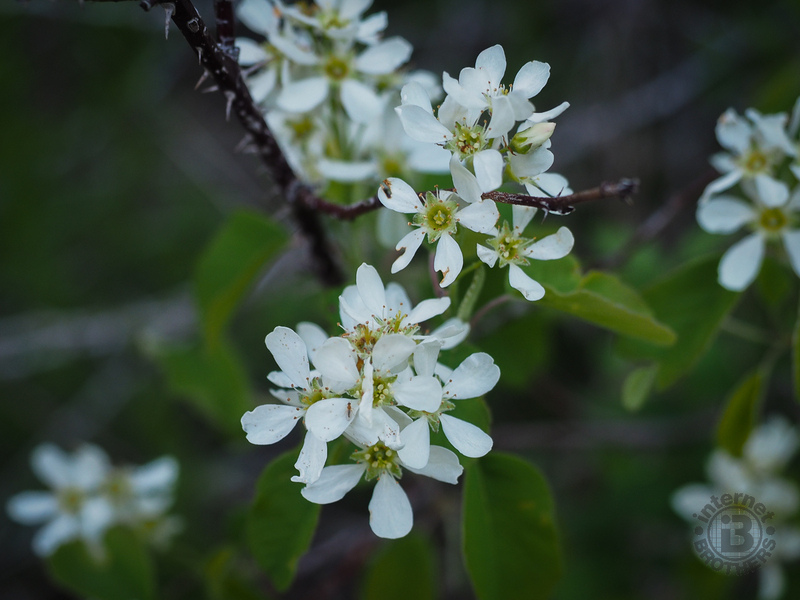 The hawthorne blossoms hide the very long spikes that grow from the stems of the bush. As you complete the 2nd mile, the canyon narrows again and the pines become taller and larger. We encountered a horse rider coming the other way, our first contact of the day. Just past two miles, the trail makes a hard left turn and begins the ascent to the rim. I’m going to do something a little different here from my traditional trail reports. Usually, I place the photo gallery at the bottom of the report. Since this loop is really two entirely different hikes, I’m going to post two photo galleries. The first will include pictures from down inside the canyon. Then, after viewing those, come back here and scroll below the gallery of thumbnails to a continuation of the report. Lastly, there will be another gallery from the rim portion of the hike. For the next half mile you climb gently through stunning pine forest, with patches of deep purple harebell lining the trail. You turn to a decidedly southerly direction for the return along the bench that is below the tallest of the cliffs. Then you see it. You pop out of the forest into the bright sunshine and see the immense devastation of the Jasper fire. It’s like a nuclear bomb went off. The trees that weren’t completely consumed in the fire are flattened, laying on the ground. It is now a treeless landscape. The only vegetation is at ground level. You can tell there used to be a lot of trees simply from all the fallen lumber, but it is now a wide open expanse. The fire started on August 24, 2000 just west of nearby Jewel Cave National Monument. Over the next week it burned a total of 83,508 acres in the southern Black Hills and approximately 90% of the land area of Jewel Cave, including the rim of Hell Canyon. But now, 18 years later, the forest floor, no longer thick with ash, hosts a variety of plants that have rebounded since the fire. It is still ugly, but it is recovering. However, it will take a long, long time for the trees to come back. We began to see other hikers, taking the loop in the opposite direction. Later, as we looked down into the canyon, we could see the same hikers now below, traversing the trail we had been on hours before. We encountered these hikers with their dog up on the rim an hour before. After about a mile, mile and a half on the rim, there is one stretch where the trail is fit tightly at the base of a cliff, with a steep dropoff on the left side. The danger isn’t really too bad, but if you are prone to vertigo, you certainly wouldn’t want to lose your balance here. Just warning… there is exposure. Another warning. On a bright sunny day you definitely want sunscreen and a hat when hiking the rim. There is no shade. Also, hold on to your hat because of that wind I mentioned before. Perhaps a mile from the end, the trail reaches undulating, rolling hills. So there is a bit of up and down, but nothing particularly strenuous. Soon after you reach the point where the rim begins to drop off the edge. You have views now beyond the canyon, and can see just how far the vast Jasper fire extended throughout the national forest. The descent is about a half mile in length, with lots of switchbacks. During the whole time I was thinking to myself how glad I was to have not gone up this direction. It is considerably steeper than the gradual grade at the north end. Thank you Echo, for the tip. Summarizing the Hell Canyon Trail, be prepared for a stark contrast of scenery. Down in the canyon it is lush and green. Along the canyon rim it is total devastation. The difference is striking. Wildfire has incredible power. This was one of my favorite hikes during the week in western South Dakota, especially the lower portion. Despite the destruction, I think you would enjoy it too. Thankfully the wildfire spared the canyon itself. If you like, just go out to the end of the canyon, then come back the same way. I don’t normally promote businesses in my trail reports, but Dave and I had such an excellent experience at the Econolodge in Custer that I had to mention it. The staff that works there are all super friendly, helpful and knowledgeable. We stayed with them for six nights and were completely satisfied. The price is very reasonable and the amenities are all that we needed. If you’re staying in Custer, SD I highly recommend the Econolodge.